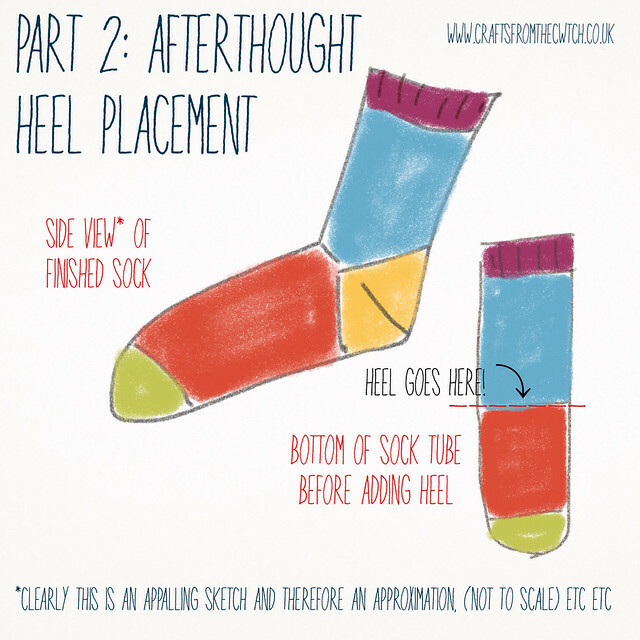 This is the second part in the "Demystifying toe-up socks" series. If you missed the first bit, you may like to go back and take a look before reading on, or it might not make sense. At the end of last week's post, we'd just finished the toe. 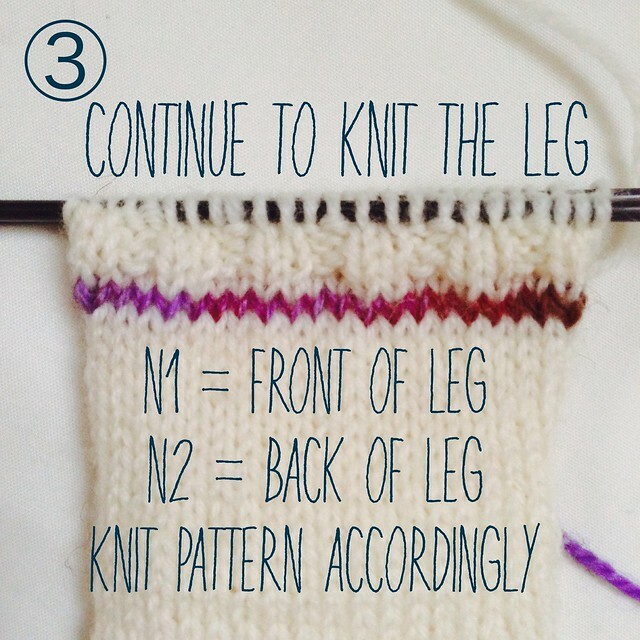 This week we're knitting the foot and leg - which is basically a tube - and deciding where the afterthought heel will be inserted, which involves just a little bit of maths. If you're following along you'll need the sock you already started, a measuring tape, and some scrap yarn - ideally something quite smooth and easy to remove later. WHY USE AN AFTERTHOUGHT HEEL? I've chosen this heel for a jolly good reason. After making myself numerous pairs of socks and wearing through the heels, I've decided this is the best - maybe the only - way forward. It means I can easily reinforce the heel and if a hole should develop at any time, the heel can be undone and re-knit without unravelling the rest of the sock. It also works really well if you're using a different colour for the heel (and if you want to reinforce it!) or if you are not sure whether you have enough yarn to finish the sock, and want to keep your options open - you can come back to the heel with the same yarn if you do have enough, or finish it with something else if not. The Afterthought heel decreases to a small number of stitches which are then grafted together (we'll talk about this next week). This is also good for me - frankly my grafting is in need of practice, and I'd rather it were in an inconspicuous place. 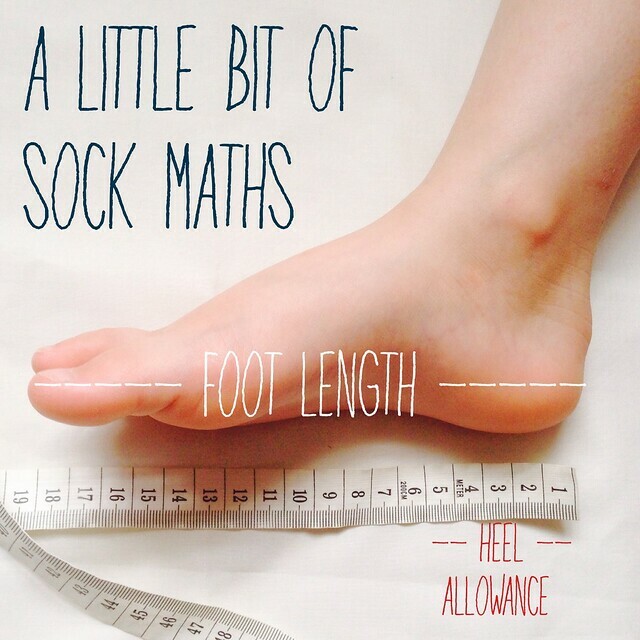 Once you've made a few pairs of socks for the feet in question, you'll become an expert at knowing exactly where the heel should be (for a child, this is subject to growth). 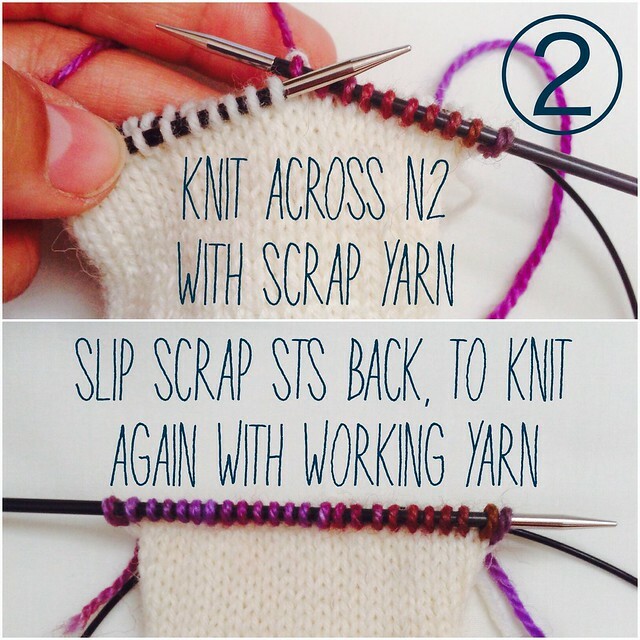 In the same way, you'll learn how many stitches make a great sock for these particular feet, as well as any adjustments which make them perfect. We'll go on to talk about those things in a later post. Different patterns may also give particular instructions based on gauge, the amount of recommended ease etc. 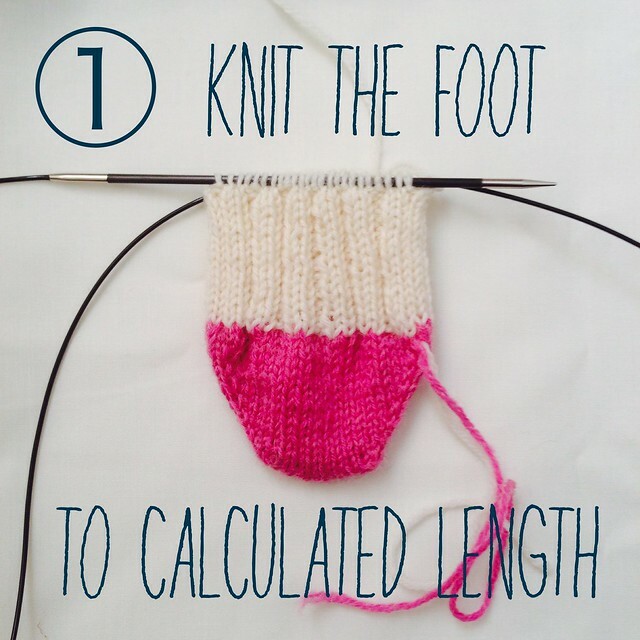 Step 1: Knit the foot until it measures the length you have calculated. My sock is for Little Miss and her foot currently measures 17.5 cm from the heel to her longest toe. 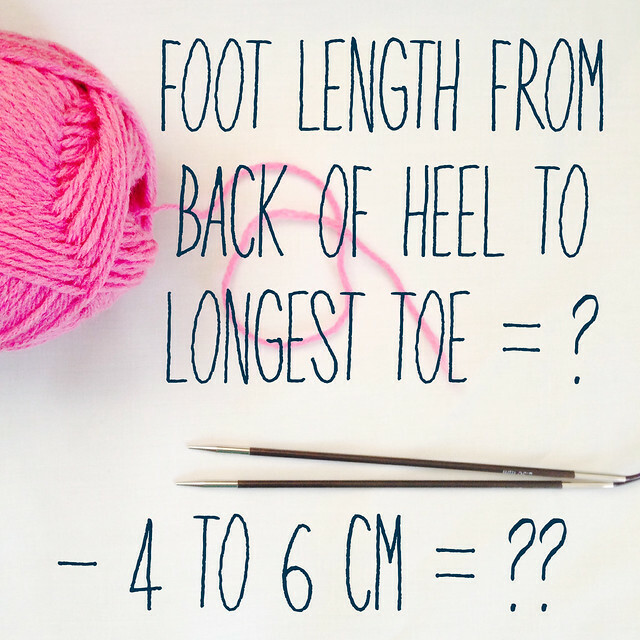 I'm using a 5cm heel allowance, so I need to knit the foot until it measures 12.5cm from the toe. As I'm using a second colour for the leg, I began with one knit round in the new colour before starting to work a simple rib across the top of the foot. The rib looks more interesting than plain stocking(ette) stitch and will add some elasticity - always good for 'gift' socks or, as in this case, the first pair of socks for someone who isn't around to try them on. This is a great series. 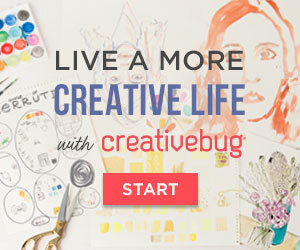 It's so helpful for people and you're doing a great job of really breaking it down into digestible pieces. 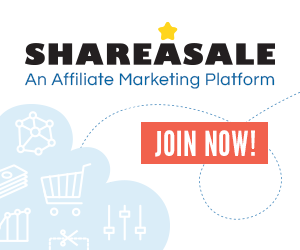 Can you tell me if you can replace an afterthought heel with another heel method? 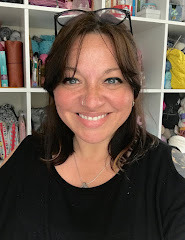 Hi Juila, there are plenty of other heel methods - they all require shaping, so you'd definitely need a pattern if you haven't made any before.